Sweat… it’s the body’s natural way to detox and in today’s modern and toxic world, we need to detox now more than ever. The urine, stool and sweat are the main vehicles that the body has for getting rid of all types of toxins. Sweating is especially beneficial for helping to remove toxins stored in the tissues. Sweating supports detoxification and keeps people healthy. Saunas have been used for thousands of years as a therapeutic modality to induce sweating. They are found in most cultures in the world today. From China to Finland to Japan to Korea to Russia to Europe, they are here to stay. All saunas can induce sweating. However, traditional saunas run at a very high temperature, usually around 180°F to 190°F, making it uncomfortable for some people and just plan unsafe for other, like people with heart issues. An important point to understand is that blood pressure starts to increase with temperatures over 140°F. The lower temperatures of far infrared saunas, typically maxing out at 130°F, means more people are able to use them so anyone can enjoy the therapeutic benefits. Infrared energy is all around us…even our bodies radiate infrared energy. The infrared spectrum is one of the safest spectrums and the most vital to health and healing. 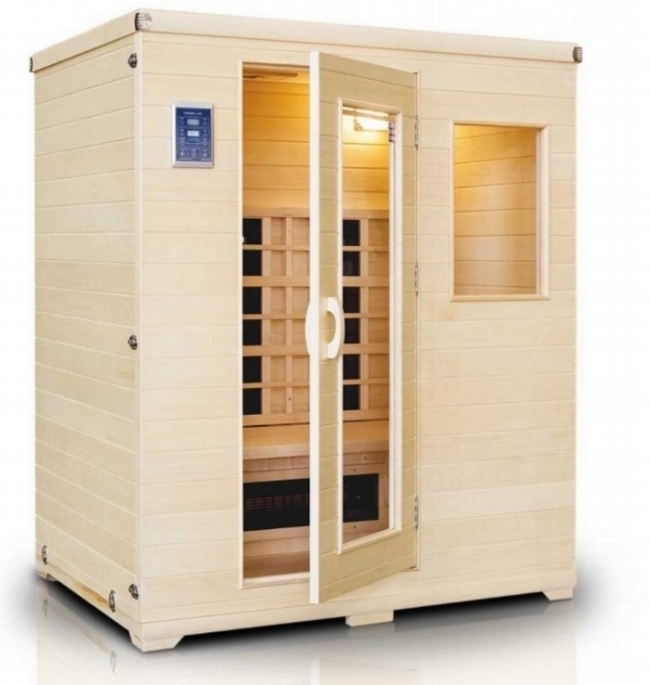 Infrared saunas use infrared energy to heat the body instead of heating the air. Infrared energy can penetrate up to 1.5 to 2 inches deep within the body, which causes a heating effect in the muscles and organs that trigger mobilization of chemicals from subcutaneous fat storage directly into the sweat. Infrared energy increases the body’s metabolic rate which results in detoxification, weight loss, relaxation, pain relief, lower blood pressure and improves circulation and skin health. Infrared wavelengths penetrate tissues and detoxify cells by vibrating ionic bonds and improving lymphatic flow and blood circulation. They can help to decrease the size of water clusters in the body, giving them greater mobility and penetration in and out of body tissues, thus carrying toxins out of cells so they can be released. Sweating certainly happens when exercising, and that is wonderful. But, an infrared sauna can achieve 3-4 times the detoxification of exercise induced sweating. It is especially great for anyone who has a taxed sympathetic system already, since passively sweating in a sauna is a parasympathetic activity, thus very relaxing and healing. Visit our Q&A page for more information.